Anchorage technology: software for the calculation and design of anchorage systems in concrete (mechanical and adhesive fasteners, cast-in place headed studs and headed bolts) in the scope of technical approvals and evaluation service reports. Base plate design: FE-codes for the calculation and design of anchor plates (fixtures) under arbitrary loading and with various connection profiles. 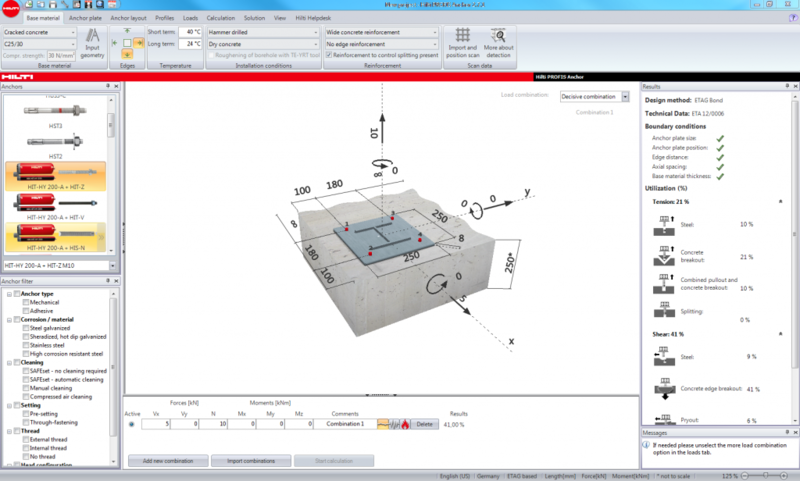 Precast elements: software for the calculation and design of precast concrete elements (e.g. concrete columns) and corresponding attachments. FE and cross section analysis: calculation and design of reinforced concrete cross sections of any shape incl. 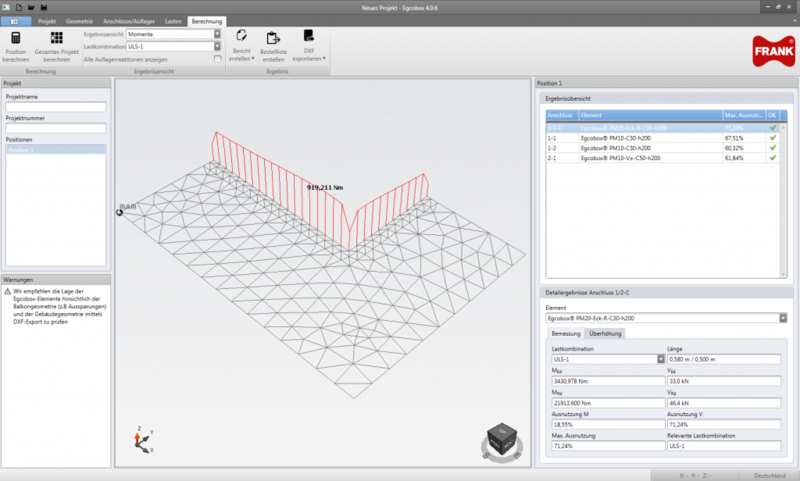 reinforcement optimization in specific applications. 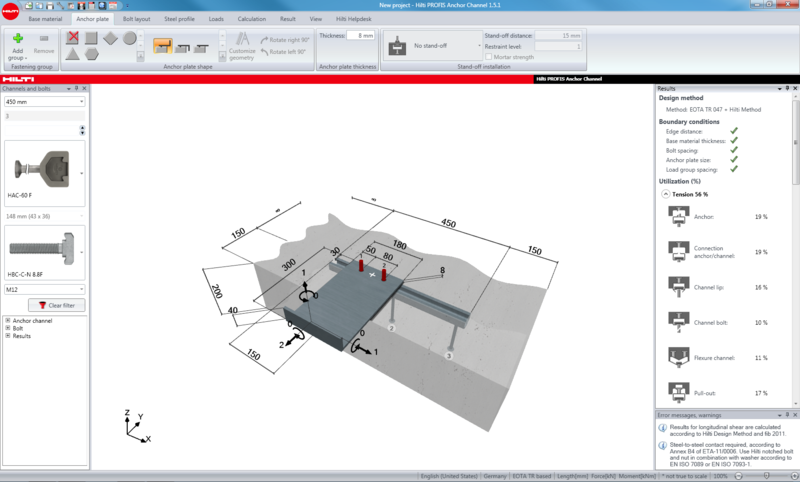 For the anchor technology design software “PROFIS Anchor” by Hilti AG all calculation kernels, interface layer to the graphical user interface (GUI) and corresponding screen outputs and printouts were developed. Beside the calculation and design of the fasteners, design of the anchor plate (free geometry) using FE method is possible. For the anchor channel design software “PROFIS Anchor Channel” by Hilti AG we are developing all calculation kernels, interface layer to the graphical user interface (GUI) and corresponding screen outputs and printouts. Various optimizations of the concrete member and the fastening are available incl. design of the base plate/bracket (free geometry). 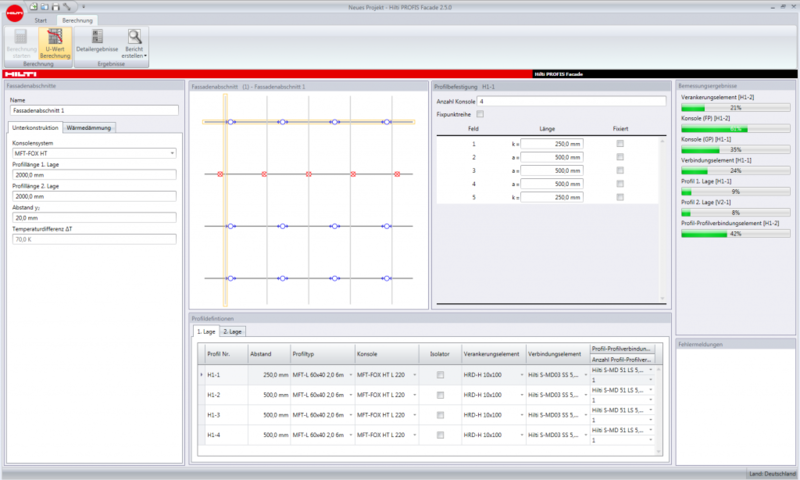 For Hilti AG a complete software incl. GUI, calculation kernel, database access and report generation for the calculation and design of the support constructions of ventilated facades was developed. 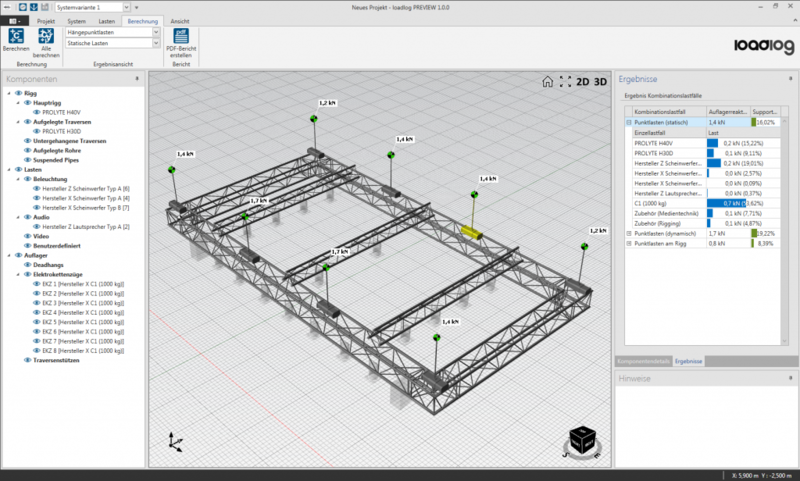 This application software utilizes our self-developed structural frame analysis tool to allow for realistic design. On behalf of Max Frank GmbH & Co. KG the Egcobox-software for the design of thermal bridge optimized cantilever connections was developed. The program consists of a modern user interface with 3D-graphics, an automatic balcony discretization, a calculation using FE analysis and a user specific design of slab connections. 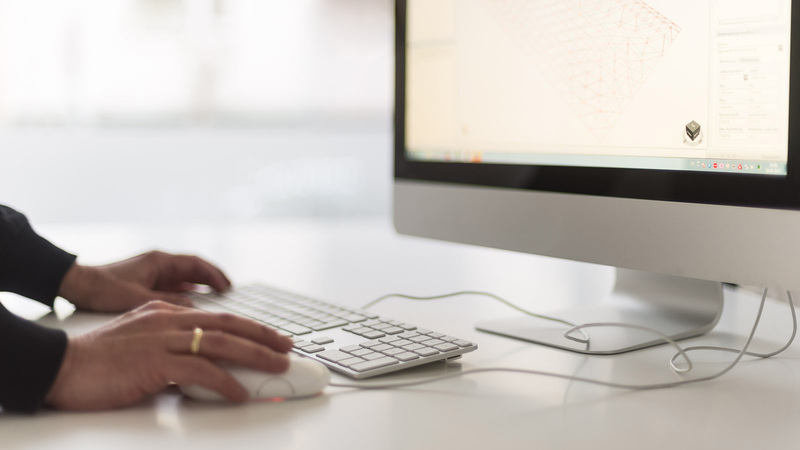 The results can be summarized in a PDF report and exported in a 3D dxf-file. 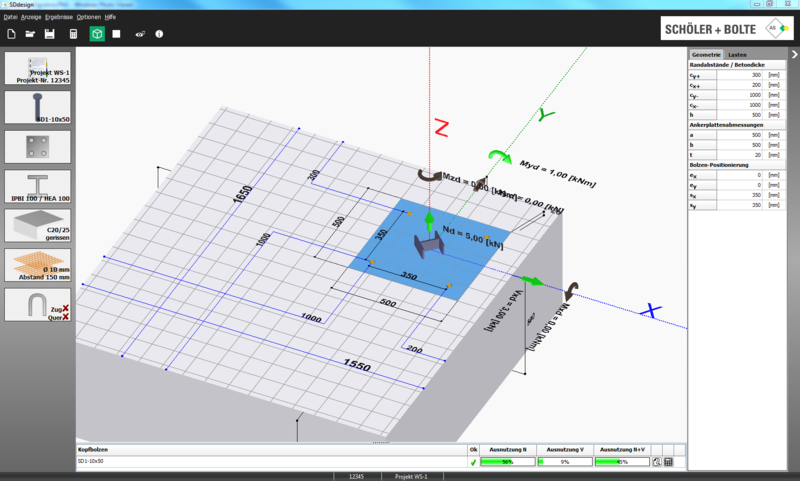 For AS Schöler + Bolte GmbH the cast-in headed stud design software “SDdesign” (graphical user interface with 3D graphics, calculation kernel and PDF reporting) was developed. Furthermore the calculation as well as the design of the fixture is possible. On behalf of Civent a commercial event technology software for the calculation of suspension loads and a predesign of suspended or ground supported truss frames was developed. A state-of-the-art and intuitive 3D graphical user interface, the calculation with FE analysis, the automatic generation of load combinations and a PDF report are part of the software.